The Obama administration is pressing for the Qatari government to remain a chief broker in the Israeli-Palestinian peace process despite the country’s longstanding financial support for the terror group Hamas, according to recent correspondence from the State Department to lawmakers on Capitol Hill. Qatar—which has come under harsh criticism by lawmakers in recent months due to its longtime financial support for Hamas—has promised the Obama administration that it will not allow the terror group to benefit from a new $150 million cash infusion that is meant to go toward reconstruction efforts in the Gaza Strip, according to the letter. The Obama administration will maintain its close ties with Qatar and push for it to have a key role in the tenuous peace process, despite protestations from lawmakers on Capitol Hill who say that the country cannot be trusted due to its close ties to Hamas, according to the letter sent by State Department officials late last month to Rep. Peter Roskam (R., Ill.). Although Qatar has pledged in past years to give Hamas at least $400 million in aid, it has assured the United States that the next $150 million sent to the Palestinians will not make its way to the terror group. "Qatar has pledged financial support that would be directed to the Palestinian people in Gaza," Julia Frifield, an assistant secretary for legislative affairs at the State Department, informed Roskam in a Nov. 21 letter. "Qatar assured us that its assistance would not go to Hamas. We continue to interact closely with the government of Qatar and will reinforce that such assistance should not go to Hamas." The Obama administration in turn will continue to rely on Qatar to serve a role in the peace process and to engage with Hamas, according to the letter. "Qatar has said it wants to help bring about a cease fire to the ongoing hostilities in Israel and Gaza," the letter states. "The Qatari government has engaged with Hamas to this end." 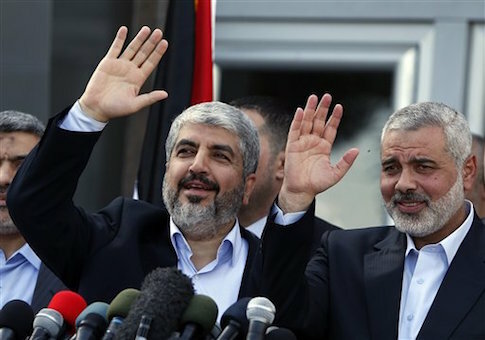 While the United States still regards Hamas as a terrorist organization, "We need countries that have leverage over the leaders of Hamas to help put a ceasefire in place," Frifield wrote. "Qatar may be able to play that role as it has done in the past." Lawmakers and experts remain dubious that Qatar can be taken at its word given its robust support for Hamas in the past. "It’s an indisputable fact that Qatar has become the chief sponsor of Hamas—an internationally recognized terrorist organization committed to the destruction of Israel," Roskam said earlier this year after he petitioned the administration to reassess its close ties to Qatar. "With Qatar’s financial backing, Hamas continues to indiscriminately launch thousands of rockets at our ally Israel," Roskam said. "The Obama administration must explain its working partnership with a country that so brazenly funds terrorism right before our eyes, even going so far as turning to Qatar to help broker a ceasefire between Hamas and Israel." The administration cannot blindly trust Qatar to cut its close ties with Hamas, said one senior congressional aide who works on the issue. "It appears the administration is willing to take Qatar for its word on funding some of the world's most dangerous terrorist organizations, and the notion that Qatar can simultaneously fund Hamas and help broker and Israeli-Palestinian peace treaty is laughable," the source said. "Congress is intent on holding the Qataris responsible for their illegal behavior and send a message that under no circumstances should the United States tolerate such brazen support for terrorism." The State Department maintains that Qatar shares President Obama’s views about the Middle East peace process. "Qatar has welcomed President Obama’s commitment to a solution to the Israeli-Palestinian conflict and shares the view that such a solution would advance security, prosperity, and stability in the Middle East," the letter states. In addition to its role in the peace process, the administration believes that Qatar can help in the international fight against terrorism and groups such as the Islamic State (IS). "We remain strongly committed to working with Qatar to confront ongoing terrorist financing and advance our shared regional goals," the State Department told Roskam, noting that more than 8,500 U.S. troops are housed at the country’s Al Udeid Air Base. "We also have a productive relationship with Qatar on key regional issues ranging from Syria to Iran," the State Department wrote. This entry was posted in National Security and tagged Hamas, Israel, Qatar, Terrorism. Bookmark the permalink.